With a southwest breeze blowing across the bay, Turtle Journal’s Sue Wieber Nourse and Rufus the Turtle Dog drove out to Truro on Outer Cape Cod to see what might have been pushed ashore with the morning’s 11.5-foot tide. 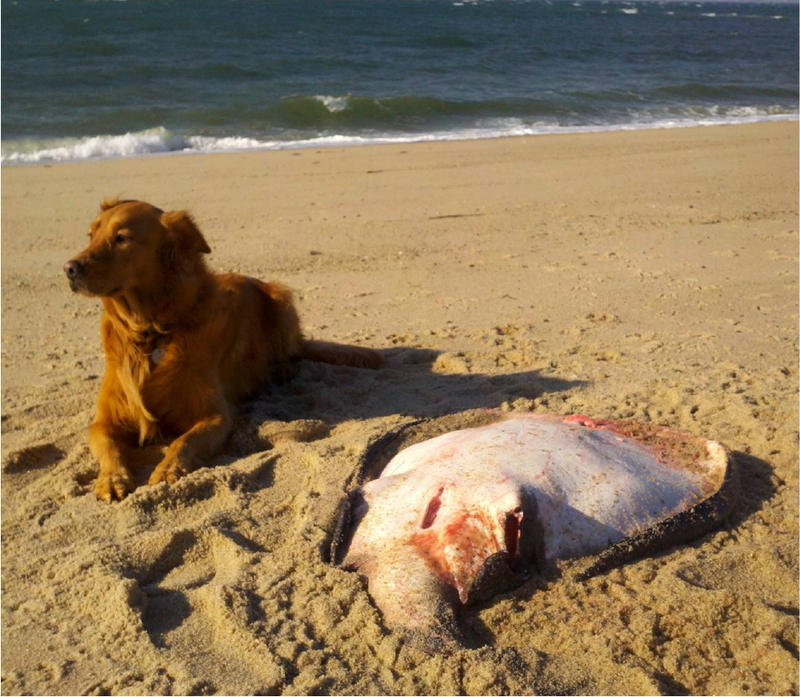 In the bright sunlight, they patrolled Duck Harbor in Wellfleet and Ryder in South Truro with great joy, but few discoveries. 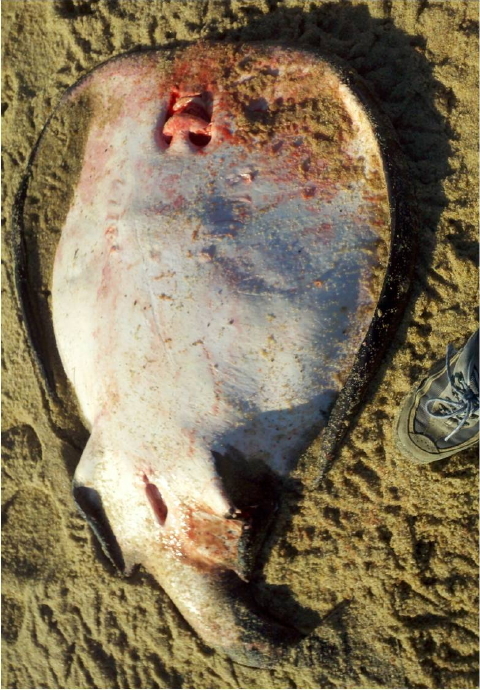 Then, an eighth of a mile north of the landing at Fisher, they encountered a female electric Torpedo Ray that had washed ashore. Turtle Journal has found torpedo rays stranded along the Cape’s bayside beaches in the fall as we search for cold-stunned sea turtles. (See Shocking Discovery! 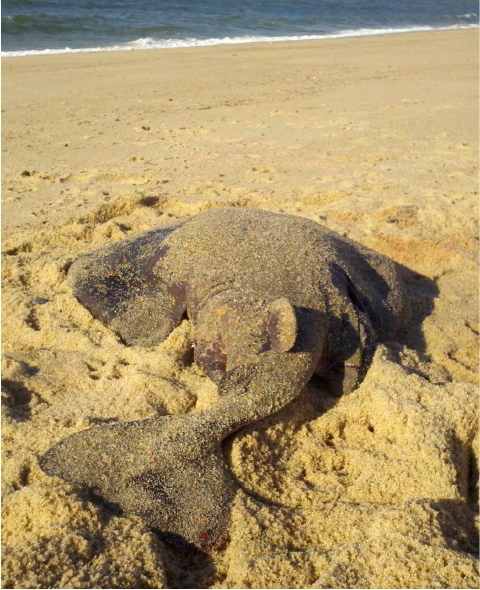 Torpedo Ray in Wellfleet Bay.) Torpedo rays have anterior organs that can generate and discharge 220 volts to stun a prey … and to keep predators like human researchers at a respectful distance. The torpedo ray has two kidney-shaped electrical organs that make up 20% of its weight and are located on the pectoral fins. They generate a power equivalent to 220 volts that stuns prey with a burst of electric current. 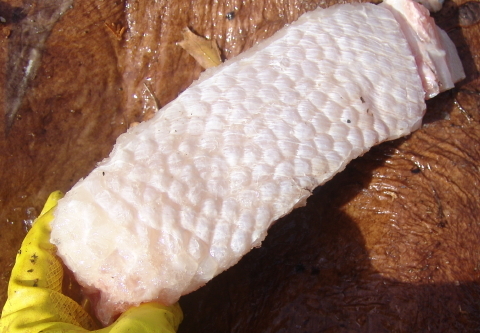 Its prey includes flounder, silver hake fish, small sharks such as dogfish, eels, worms and crustaceans. After stunning its prey, the torpedo ray guides food with its pectoral fins toward its protruding mouth for ingestion. Without a full scientific kit on hand, Sue managed with the tools we wear on our feet for a rough field measurement of specimens. This female measured approximately four feet long and three feet wide, and seemed in relatively good shape. 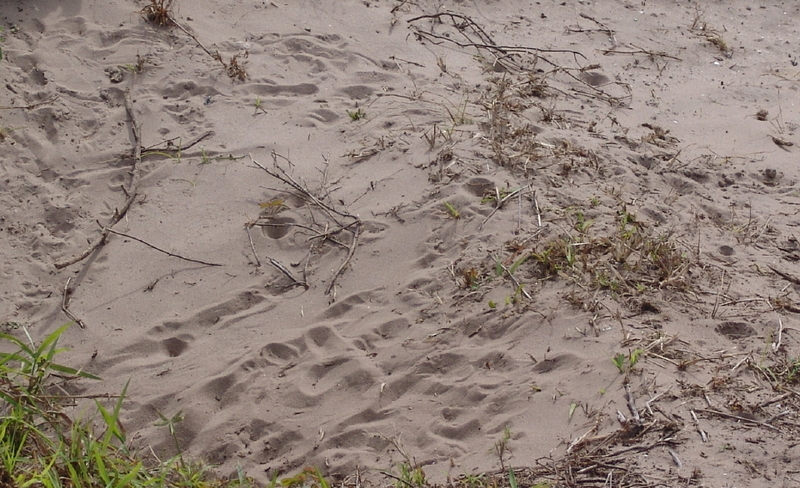 Turtle Journal informed the Wellfleet Bay Wildlife Sanctuary of the specimen’s location, so that a follow-up necropsy could document the specimen and possibly determine its cause of death. 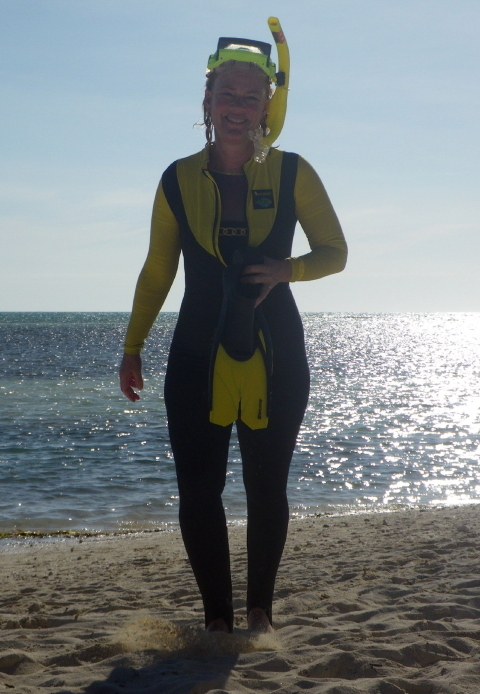 Rising from the brilliant sunlit waters of the Bahamas, Sue Wieber Nourse slips through the warm sands of Barefoot Beach after a long snorkel dive in the channels off Coco Cay. Morning temperatures hovered in the low 80s with a gentle easterly breeze swaying the palm trees shading our cabana lounge chairs. The only cold thing on this beach was the iced Heineken. 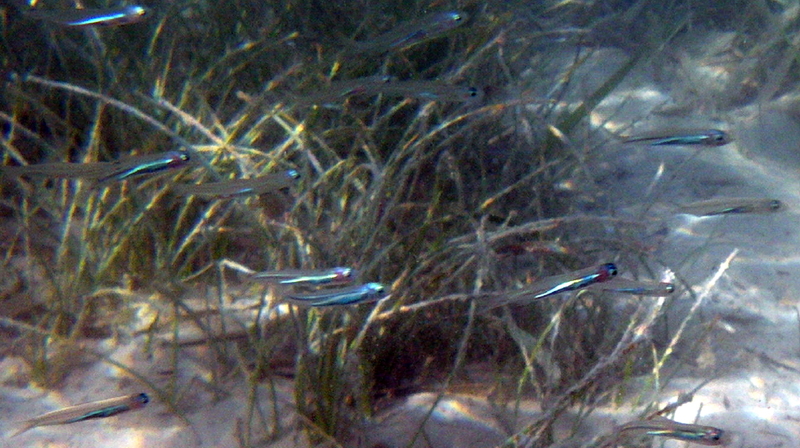 Patrolling clear, deep channels separating fields of turtle grass, Sue cruised by her near-namesake predator, a nurse shark, hovered over an enormous ray scouring the sandy bottom for grub, and observed conchs of all sizes crisscrossing the submerged flats like Great Plains tractors. Experiencing that eerie, chill-down-the-back sense of being followed, Sue glimpsed a barracuda through the corner of her mask, as the fish tracked her every movement. It was a juvenile no more than two feet long, but every inch a predator, and practicing what predators do best. 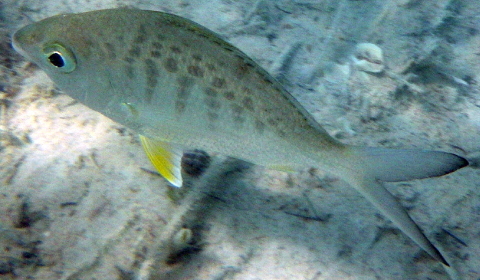 Don Lewis dove north of Sue and tested the Journal’s underwater camera on a variety of tropical fish. He discoverd a tiny live conch about 2 inches long gliding along the bottom of a shallow channel. 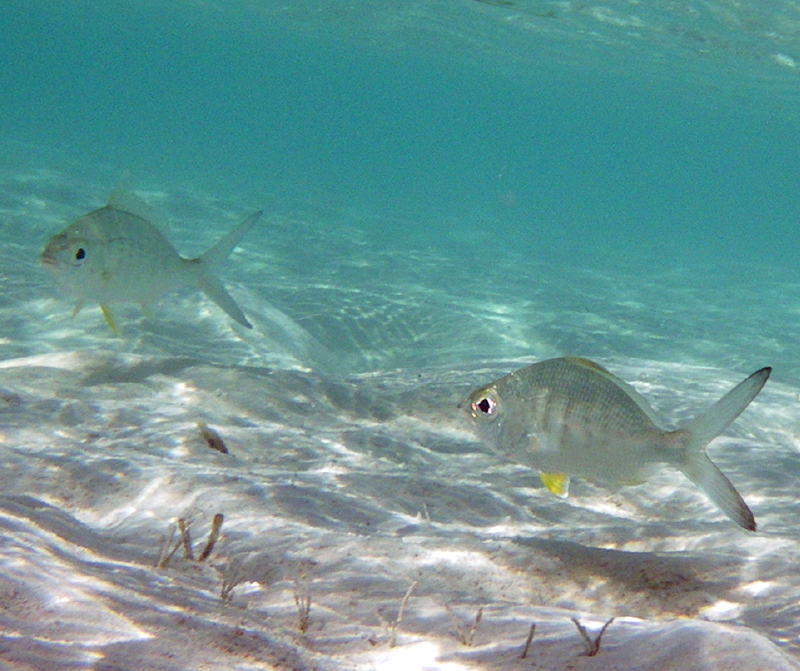 While the Bahamas can’t match St. John USVI for abundance and variety of reef fish and colorful, healthy corals, for this brief winter interlude when ice storms are battering the Great White North, the Bahamas make a perfect refuge. Yep, they’re right. 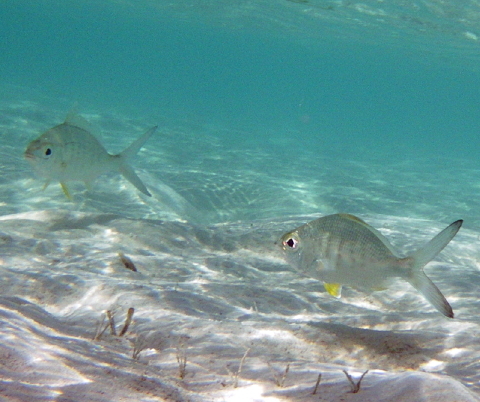 It is better in the Bahamas … and 70 degress warmer, too. Looking for alien creatures? No need for NASA to blast off into Outer Space when its most famous launch pad has already been invaded by critters straight out of the backlot of a low budget, 1950′s horror flick. Gopher tortoises check all the right boxes. Exotic? Yep. Cold-blooded? You bet. Ancient species? 300 million years and counting. If we were NASA, we might suggest looking down rather than up for the greatest discoveries. The Turtle Journal team headed for the Bahamas over the Christmas holiday with a day’s stopover in Port Canaveral to re-acclimate our frozen northern bodies to tropical conditions. While there, we arranged a behind-the-scenes, VIP tour of the Kennedy Space Center, guided by an official NASA representative. Little did we expect to turn this brief vacation interlude into a busman’s holiday. 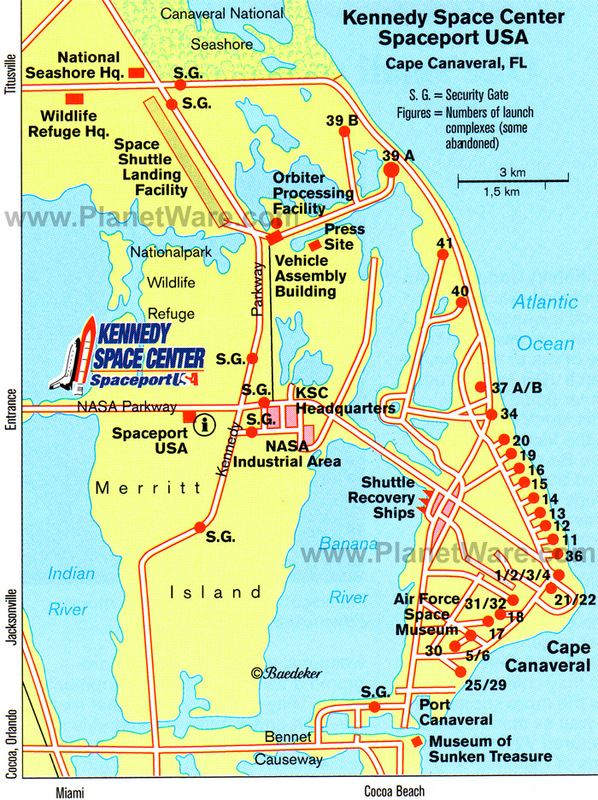 More than 3.5 miles from NASA’s gigantic Vehicular Assembly Building (VAB) at the other end of the massive crawlway stands Launch Pad 39 Complex, famous as the gateway for all Apollo program (moon) launches, as well as space shuttle launches. See map below. 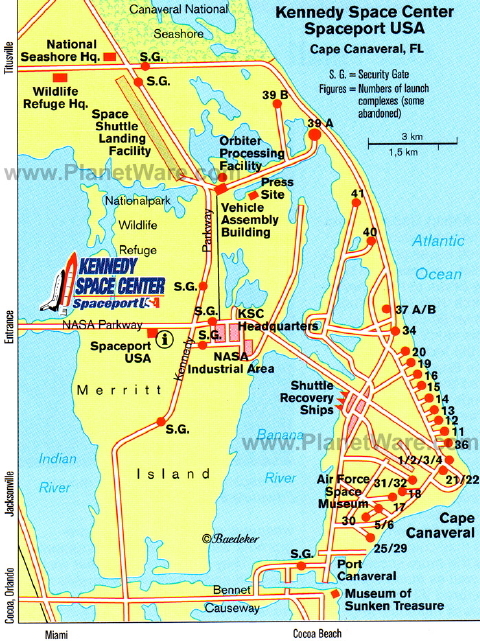 The 39 A & B Complex was positioned so distant from the VAB because in case of a catastrophic failure, no one would survive the fuel explosion closer than 3.5 miles. In fact, within a few thousand feet of the launch pad, the sound waves themselves, generated by a normal blast off, would be powerful enough to stop the heart of anyone unbuffered from their effect. 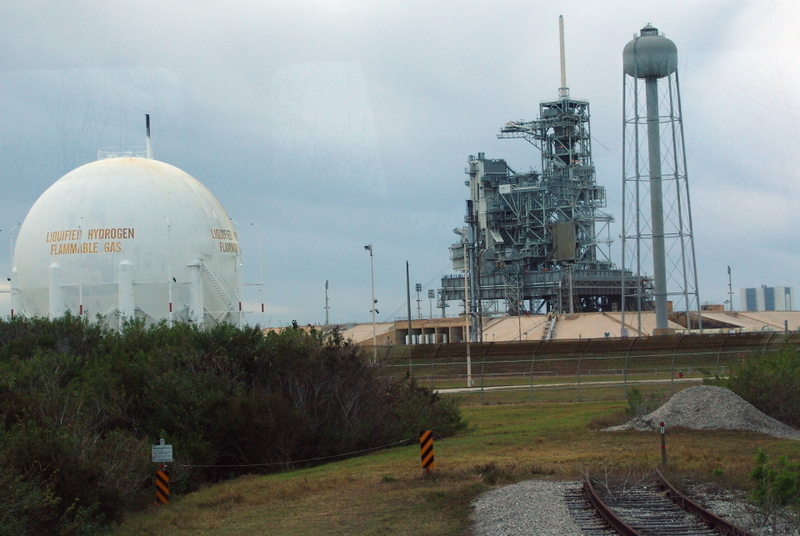 So, perhaps you might be as surprised as the Turtle Journal team when our vehicle drove through the Launch Pad 39 Complex. Between 39A and 39B — the launch pads for every moon and space shuttle flight, we spotted a large gopher tortoise scurrying towards its burrow. 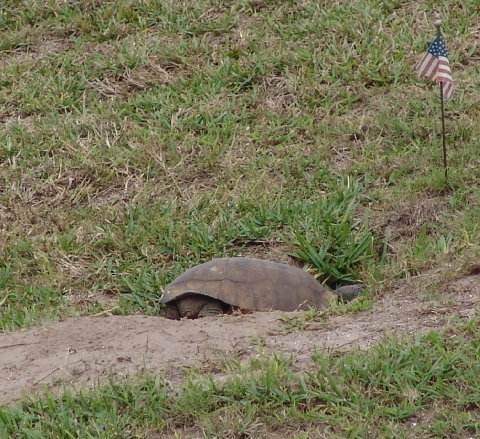 The mature turtle scampered down the hillside as our vehicle approached and plunged its head into the burrow opening. With his head in the burrow and full body and carapace outside, the tortoise couldn’t see us … and according to the First Universal Rule of Turtles, “If you can’t see your predator, then your predator can’t see you.” This old specimen has been around the Cape for a long, long time. We’re sure this turtle has witnessed the launches of Apollo 8 and 11 en route to the moon, and every space shuttle flight that has ever flown. At the same time, the most honored human VIP observer has to stay more than 3.5 miles away. When it comes to space launches, turtles get the best seats. 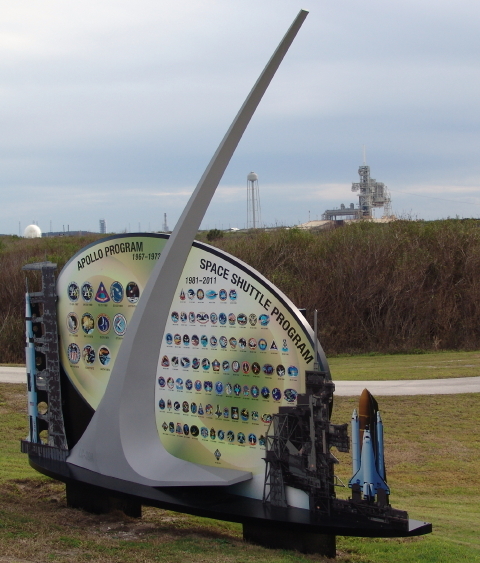 Nearby Launch Pad 39B is being renovated for the next generation of manned space flights where humans will venture once more to the moon, to the asteroids and then to Mars and beyond. Our tortoise friend will be on hand to experience these adventures, too … but he won’t be alone. In a nearby burrow, we found tracks from at least one juvenile tortoise. 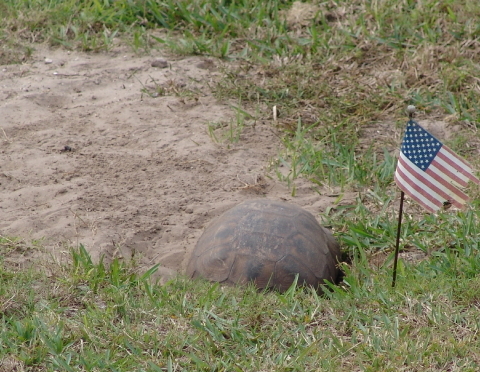 It’s quite amazing the prized real estate that Florida gopher tortoises have staked out. These Kennedy Space Center gopher tortoise burrows are situated directly on the Atlantic shoreline, across the Florida peninsula from their kissing cousins who occupy equally pricey burrows at the Ritz Carlton Naples Resort on the Gulf. 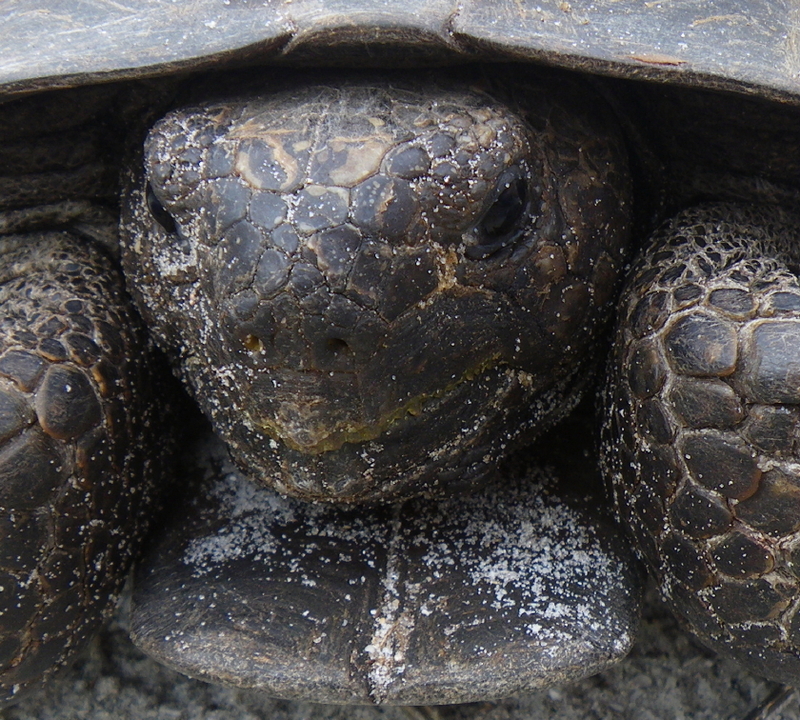 You are currently browsing the Turtle Journal blog archives for January, 2013.